Both formations seem to depict some sort of a Galactic Star Map ... last years Poirino formation also depicted a coming partial Solar Eclipse highlighting our Sun (Solar System) in a galactic perspective of things ! Two drunk blokes from the local tavern did this. hey even smart people get drunk too! @ Joe Sacco - Drunks loose brain cells at rapid rate, so don't remain smart for long time. 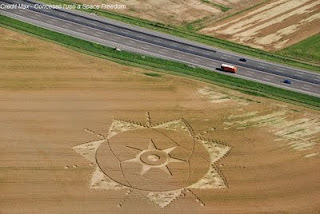 "Enki Ea" a name of a sumarion god is coded in ASCI Code, in that outer pointlines. As for the circle made in 2010, the outer dots coorespond to the lunar cycle. 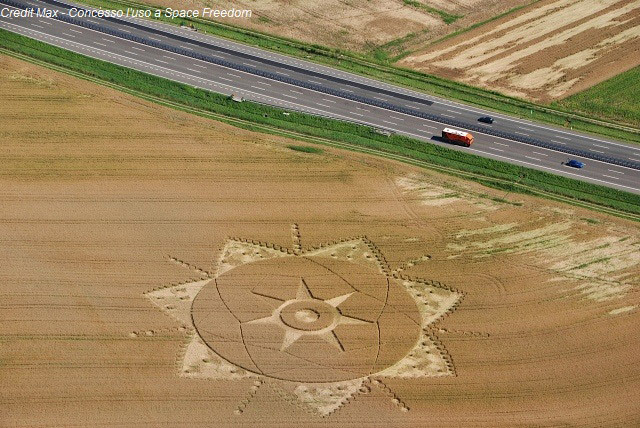 Note the one highlighted outer dot (on the right side in the first pic). The big dots (which touch the main circle) represent full moons, while the smallest dots (which make the points of the out triangles) represent new moons. The highlighted dot is the second dot past a full moon. 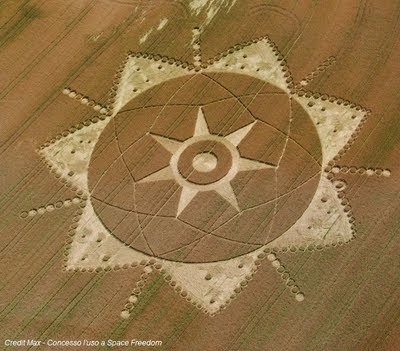 This circle appeared on the second day after a full moon. It's like a timeline, and the creator was saying, "You are here." note that it has seven points rather than the six usually associated with fruit of life type formation like the one from the previous year. 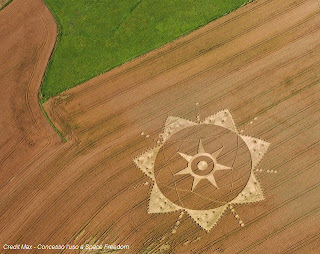 "A new ASCII code was drawn in crops at Poirino, Italy on June 20, 2011, and seems to identify the crop artist as "Ea" or "Enki" who was a tall, blond, extra-terrestrial god in ancient Sumeria. 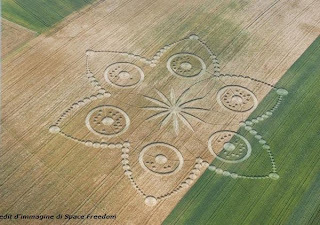 A new crop picture which appeared near Poirino, Italy on June 20, 2011 shows at its centre a large seven-pointed star, which clearly resembles another star-like crop picture from Lane End Down in southern England during July of 2005. That 2005 crop picture predicted the outburst of comet 17P Holmes two years later in October of 2007. Could another cometary outburst be imminent?